Recently, CopyWrite had the honor of attending an event that made us smile. 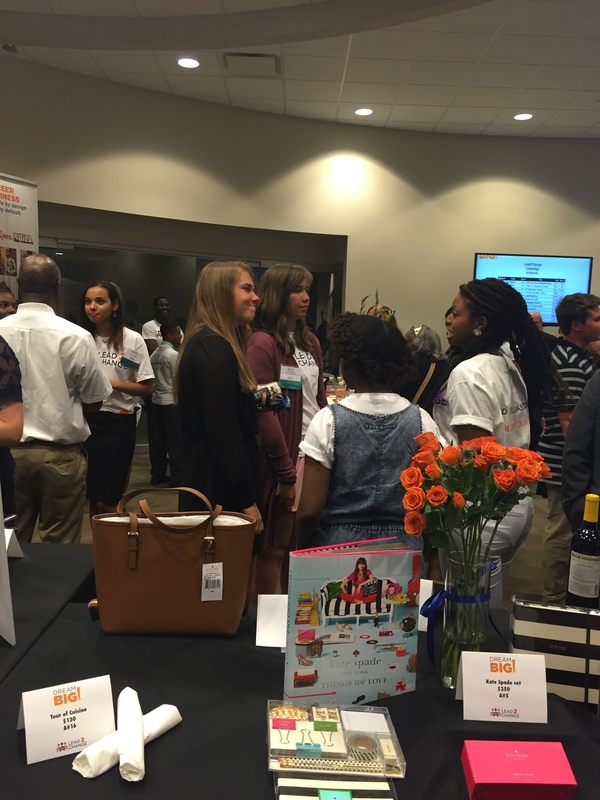 Dream Big 2015 presented by Lead 2 Change. "Hey. Are you busy July 31st 6-8 I need you and Carsyn to come to this event for my job"
NEED??? That's a strong statement. But with a quick glance at the schedule and a confirmation from Carsyn, I RSVP'd. Even after saying yes, we were not quite sure what the Dream Big event was all about. We knew Lead 2 Change, was a non-profit organization that worked with youth but how impactful they have been we would soon discover. As we approached the entry we could see and hear a young girl singing over a microphone. At the door we were greeted by smiling young faces who ushered us to a table where more young people gave us custom pre-pretend name tags. Soon we spotted, the person who had invited us. He welcomed our presence and urged us to look around, eat, mingle, and enjoy the event. As we explored the room, we noticed there were several food stations, a DJ, and a layout of items presented for the silent auction to raise money for the organization. There was even a photo station where you could take silly pictures to document the event. Everyone seemed to be enjoying themselves. But what stood out the most was the amount of youth everywhere, looking bright, purposeful and determined. The feeling just seemed right. Out of nowhere a change in the music sparked the crowd and a Flash Mob broke out. Dancing and singing ensued, as they coaxed all attendance to enter the presentation hall. In this room we learned the origins of Lead 2 Change, their journey, and heard several testimonials from people who had spent their youth in the organization. The stories told were personal, but all reflections had a binding source. The organization had planted an acorn within these people that was now growing into a tree. This tree was presented as opportunities, skills, but most of all confidence. Where we found the shock in all of this, was the control and responsibilities given to the youth. The young are the ones who sit on a board and make a decision about who should receive grants to spark a change in the community. They hear the presentation, they debate over the options and they vote on the best candidate. This act of control is something that is not often given to the young, so its stimulation of thought is not always tangible. But here we were shown how it works through a video clip. The professionalism and effort was undeniable. These young minds had strong opinions, used logic and communicated with each other gracefully. And they all Thanked Lead 2 Change for it. So what was Dream Big 2015? That day we got to see the presentation of the $5,000 awards & the planting of an acorn that will soon grow into something much greater. A positive we could not ignore. So we just want to say Lead 2 Change #WeSeeYou !! !